Before I moved to the Philippines in 2010 for work and again to Indonesia in 2012 I went through extensive cross cultural training courses. There were many discussion on how to adapt to a new way of living in a new country, understanding cultural differences and ultimately not getting stuck in the "expat bubble". I often joked with my colleagues that it would be nice sometimes to have an expat bubble to visit now and then but in many of the locations where I worked it was never really an option. Instead, I made local friends, bought groceries at the local market, walked or used local transportation, and ate the local food. There were times I received special attention because I was a foreigner but I always tried to approach this from a place of curiosity. After all growing up on an island frequented by tourists I grew up with the same curiosity to know "what are you doing here?". I find human migration fascinating, and recently it's been the stories of people my age that have struck a cord. After living in different parts of the world with a mix of people from different cultures and backgrounds I've realized more and more that there are commonalities between all of us regardless of where we call "home". Yet it is often outdated terms like "expat" or "immigrant" that set the tone for how a new community perceives us. I've been lucky to have found my "community" in many of my foreign homes often made up of a strange mix of locals and foreigners brought together by common interests. Recently, a friend of mine was featured in a video that went viral around the world (largely thanks to the many Ilokano's living around the globe). My initial thoughts when watching the video were "What's so special?" after all the video shows Firth asking for simple directions in the local language. I've become so accustomed to hearing Firth (a Canadian by birth but having lived the majority of his life in other countries including Cambodia, Egypt, USA, Scotland and most recently the Philippines) carry on conversations in Ilokano. And while, Firth is a stellar example of adopting to his new home (becoming fluent in a non-dominant language is no easy task) any one who has travelled to another country as undoubtedly met the foreigner living in the expat bubble, that makes you wonder why they ever left home in the first place. Growing up I had never placed much value on the colour of my skin. Rather I was encouraged to identify as more lofty things like a student, a dreamer, a traveller traits that may not be so evident at first glance. Many countries have a word for foreigners, in Indonesia I was a "bule" and in the Philippines I was an "Americano". But these words identify me as a white person not necessarily a foreigner. (Being identified as "pretty" and "fat" is another topic all of its own). And I guess where I am trying to go with this is that sometimes language lags behind reality. For what do you call the Filipino born and raised in Canada or the Indonesian adopted at birth and raised in Sweden. Often, the language and words we choose to use are defined by our circumstances, many Filipinos commonly use the term "Americano" because of the occupation by the American Army in the Philippines. I often find white skin the most confusing, especially coming from a country like Canada that was founded by foreigners. A country where you can be Indian, Filipino, Italian, French, Croatian etc... and still be Canadian. I guess all I'm saying is the next time you meet someone or see someone on the street, see past their outward appearance, their age, their race, their colour, and see the individual and the complex layer of life experiences that have gotten them to where they are now. Take a moment to reflect on the words you choose to and how they might be viewed. And while I should be celebrating I'm left thinking that diversion is a poor measure of how we are really doing. What diversion doesn't account for is the most important R in the recycling hierarchy: REDUCE. While working at an event the other day, I was talking to a young mother about where she could recycle her plastic bags and film plastics. She mentioned that most families with children were more likely to throw it out than return it to depot. And its true a third of the waste I generated this month needed to return to a depot including a huge (!) bag of film plastic, refundable beverage containers and light bulbs. And maybe it's my naive single childless self that is so troubled by this concept of doing what is easy rather than doing what is right when it comes to children. I think childhood is such a wonderful opportunity to teach good stewardship habits. To learn the basics of reduce, reuse and recycle. To question whether we really need something in the first place and consider what will happen to it once we are finished with it. Because at the end of the day there is no away. Our waste (whether it be garbage or recycling) does not simply disappear. Future generations will be left to deal with the legacy of our waste, other countries are already facing the hardships of "recycling" that is deemed to have little or no value in North America. Our children and grandchildren will faced with decisions on how to fund future landfills or waste to energy projects as our current landfills reach capacity. And that seems to me a huge burden to have to bare. Get your 5Rs right: Refuse what you do not need, Reduce what you do need, Reuse what you consume, Recycle what you cannot Refuse, Reduce or Reuse, and Rot (Compost) the rest. 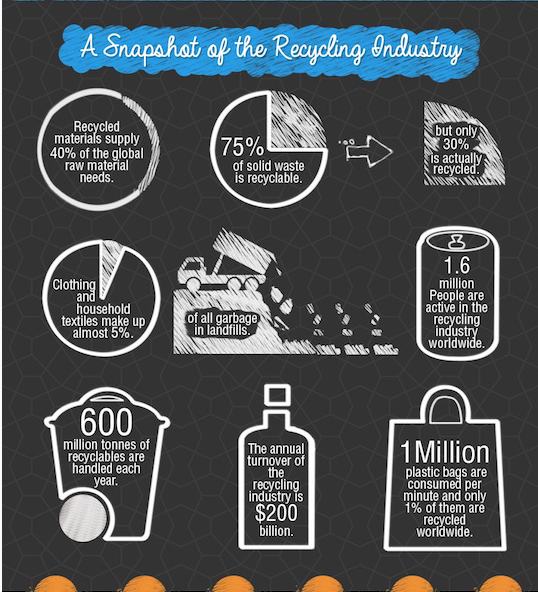 What do you do on a daily basis to reduce your waste? First off I want to start by admitting something... I haven't taken my garbage out since I started this month long Zero Waste project. That same bag of garbage I photographed during week one is still hanging out under my kitchen sink. Why? Because the bag simply isn't full yet. What I've noticed is that by removing organics from my household garbage what's left in the garbage bin really doesn't smell at all. But I'm getting away from this week's topic: Convenience. If you listened to the BBC podcast I posted the other week it touched on the topic of convenience. Most of the waste and packaging we consume today is largely due to convenience rather than necessity. Its much easier and quicker in our busy lives to buy something pre-made rather make it ourselves. But what this means is that we are one step further from the source of the things we buy each day. I enjoyed this video from The Coast in (one of) my old hometowns Halifax on shopping at the Farmers' Market vs a Supermarket. The Clean Bin Project: Is it possible to live completely waste free? In this multi-award winning, festival favourite, partners Jen and Grant go head to head in a competition to see who can swear off consumerism and produce the least garbageTheir light-hearted competition is set against a darker examination of the problem waste. Post-Consumer Plastic Film Recycling on the Rise 1.14 billion pounds of plastic film were collected in 2013 which represented the highest amount recycled since the survey started in 2005. So if you've been reading my blog for awhile now I would hope that you are already on the recycling bandwagon (Dad I'm looking at you!) but did you know you could unintentionally be sending your recycling to the landfill? While every recycling collector is different here our some easy tips for ensuring that you are maximizing your recycling while ensuring that your recycling you putting out is getting recycled and not sent to the trash. Why you might ask? Most recycling is sorted by hand or machine in a Material Recovery Facility. If recycling is bagged or "nested" in can be rejected at some facilities. DON'T: Tie up your recycling in plastic bags. For safety reasons, these bags cannot be opened once they reach the recycling facility. The only exception is shredded paper, which must be tied in a clear bag so that the contents can be identified (loose shredded paper can blow away and become litter). Anything else that has been tied into a plastic bag - even if its see through - will be discarded. DO: Keep it loose! Instead of tying recycling in a plastic bag throw materials loose into the recycling bin. DON'T: Nest materials. While stacking containers that held the same contents is okay (i.e. yogurt containers), metal and plastic containers stacked together are difficult to separate. Similarly, papers stashed inside a cereal or shoe box can't be separated. Materials arriving at the recycling facility in any of these ways cannot be recycled and will be sent to the landfill. Not much to report this week mainly because I haven't had time to sort through my weekly haul from the week. What I have noticed however, is the recyclability of some of my favourite things. Cottage Cheese. 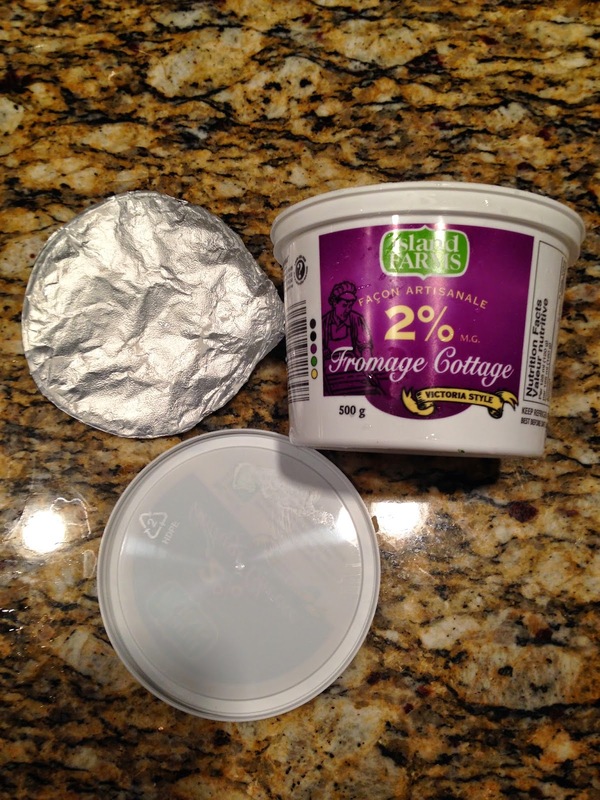 Unlike other plastic tub containers this cottage cheese container is 100% recyclable (foil liner included). 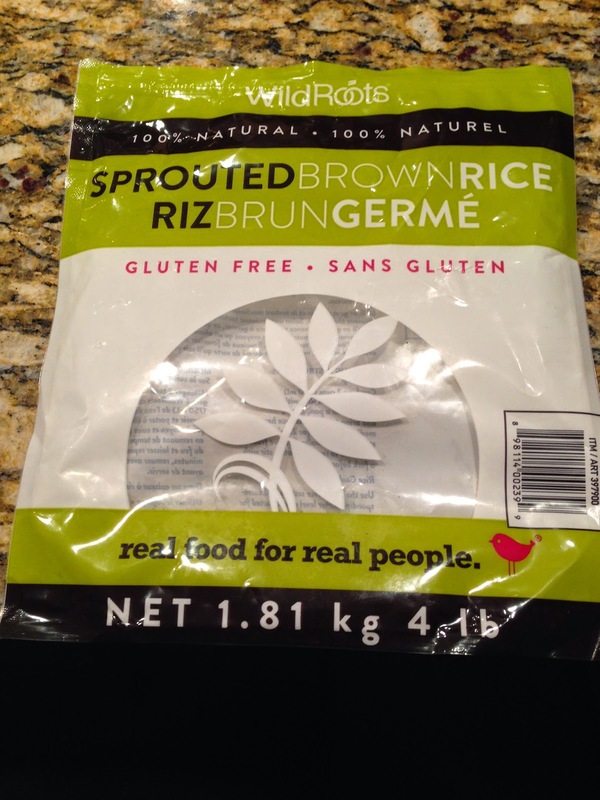 In our region, and most areas of BC standup sealable plastic packages like this aren't recyclable which means this plastic is destined for the landfill. I've definitely been on the lookout lately for packaging that is 100% recyclable or compostable or at the very least biodegradable. Obviously, the best way to do this is to buy fresh, local whole foods whenever possible. Which means I am certainly missing the amazing local food markets in Asia as the one food item I've yet to find without disposable plastic packaging is tofu. I was listening in on a workshop the other day put on by the West Coast Climate Forum about the "Food Too Good To Waste" Toolkit put out by the EPA. Although this is an American program I think that there are some really great tools and resources everyone can use regardless of where you are in the world. It was also great to see case studies of Community Based Social Marketing (CBSM) projects in action! Get Smart: See how much food (and money!) you are really throwing away. The first step to reducing food waste and creating lasting awareness is to actually measure how much food you are throwing away. Smart Shopping: Buy what you need by simply making a list with weekly meals in mind, you can save money, time and eat healthier food. If you buy no more than what you expect to use, you will be more likely to keep it fresh and use it all. 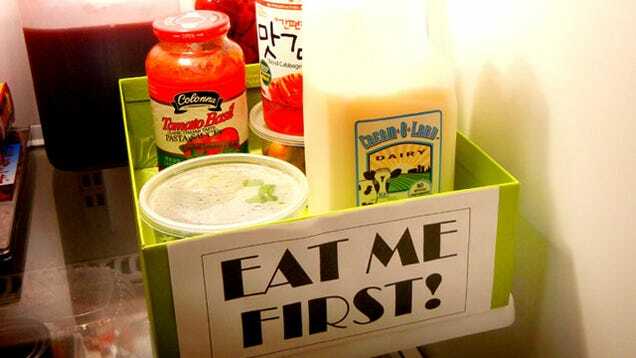 perishable foods soon after shopping. It will be easier to whip up meals later in the week, saving time, effort and money. Smart Savings: Eat what you buy. Be mindful of old ingredients and leftovers you need to use up. Move food that's likely to spoil soon to the front of a shelf or designated "Eat Now" area. Budgeting and food planning on have big on my mind lately as I try and make my money stretch as much as possible while still preparing healthy and nutritious meals. I find cooking and eating for one more difficult at times and am still trying to find the perfect balance of planning ahead and keeping things fresh. Aside from a couple moldy oranges, I think I've been doing pretty good in the food waste department this week but its certainly something I want to keep my eye on. Just Eat It If you get a chance be sure to check out this great documentary filmed here in BC. I have to admit in some strange way this feels like one of the more intimate things I've posted on the blog to date. But here goes, this is my trash for week 1 (this is actually a little over 1 week as I didn't empty my bins at the start of this project). First off I'm shocked at how quickly my recycling accumulated! This doesn't even include glass and plastic bags/film (which I will discuss in another post). Obviously this hasn't been a very typical week with the move into a new place and cleaning out our old one. When preparing for these photos I actually found myself pulling things out of the "trash" that I had originally thrown out only to later realize they could actually be recycled. Its also important to note that this does not include my food waste which gets collected separately for compost. This exercise has certainly given me time to think about the different things I purchase and how wasteful some of them are in terms of packaging. I have a feeling my trip to the grocery store is going to take longer today as I analyze all the packaging.